Then-Attorney General William Barr, left, with President George H.W. Bush. 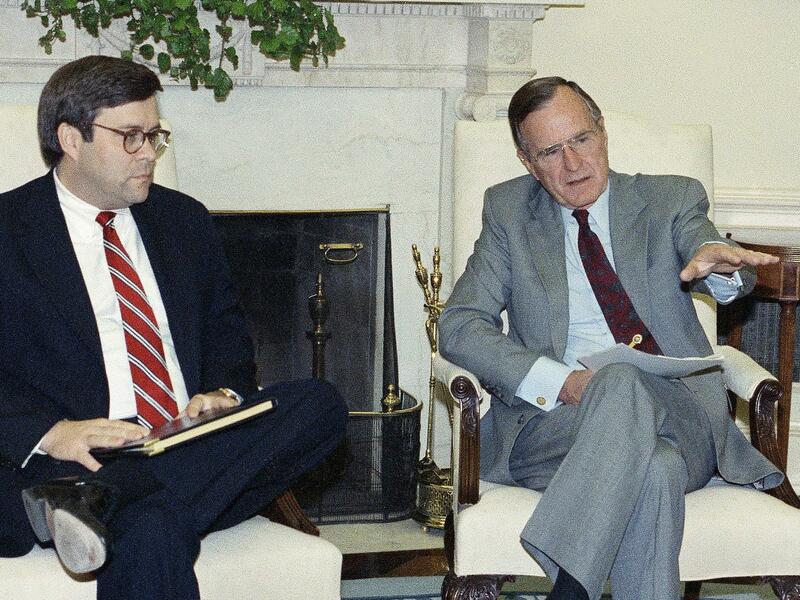 Barr supported Bush's pardons for six people caught up in the Iran-Contra scandal, which is resonating today. This won't be the first time that William Barr, President Trump's nominee to become attorney general, will be involved with what's been called a "witch hunt." Barr, who is scheduled to go before the Senate Judiciary Committee on Tuesday for his confirmation hearings, ran the Justice Department once before, under President George H.W. Bush. Back then, the all-consuming, years-long scandal was called Iran-Contra. On Dec. 24, 1992, it ended when Bush pardoned six people who had been caught up in it. "The Constitution is quite clear on the powers of the president and sometimes the president has to make a very difficult call," Bush said then. "That's what I've done." Then-Attorney General Barr supported the president's decision in the Iran-Contra case, which gave clemency to people who had been officials in the administration of President Ronald Reagan, including former Defense Secretary Caspar Weinberger. He had been set to go on trial to face charges about lying to Congress. To the man who led the Iran-Contra investigation, however, the pardons represented a miscarriage of justice. "It demonstrates that powerful people with powerful allies can commit serious crimes in high office, deliberately abusing the public trust without consequences," said Lawrence Walsh, the independent prosecutor in the case, at the time of the pardons. Barr said later that he believed Bush had made the right decision and that he felt people in the case had been treated unfairly. "I favored the broadest pardon authority," Barr said. "There were some people just arguing just for Weinberger. I said, 'No — in for a penny, in for a pound.' "
As Washington prepares for Barr's confirmation hearings on Tuesday, this controversy from 1992 has begun to feel very familiar. Today's Justice Department also is running a high-stakes investigation into the current administration: Whether Trump or his campaign coordinated with the Russian attack on the 2016 election. The president's onetime aides also have been caught up in it. Trump, meanwhile, calls the investigation a "hoax" and a "witch hunt." And there also has been talk about whether Trump might pardon some of those people — or even, potentially, himself. Would Barr support pardons again? Barr's track record raises questions about whether he'd support the president if he elected to use his pardon power down the line in the Russia investigation. 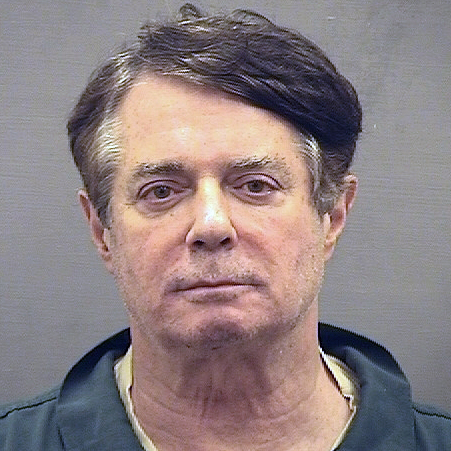 Former Trump campaign chairman Paul Manafort is awaiting sentence following a conviction and a guilty plea. The president hasn't ruled out a pardon for him or others. "His view of the pardon power and in what circumstances in which it ought to be exercised is an extremely relevant issue, particularly because of the widely publicized accounts that the president has considered pardoning a number of people," said attorney Michael Bromwich, who worked on the Iran-Contra team. Bromwich had left the team by 1992 but he remembers the reaction to Bush's pardons. "The office had developed evidence over the course of many years suggesting that there had been a high-level conspiracy to obstruct the investigation ... designed to protect, first President Reagan, and then-Vice President — and ultimately President — Bush." Democrats are expected to press Barr on Tuesday about his views on the ongoing Russia investigation, about which he has been critical. Barr submitted a legal memo to the Justice Department explaining why he thought special counsel Robert Mueller didn't have a legal basis on which to investigate Trump for possibly obstructing justice, and Barr also has criticized the special counsel's office in the press. Barr's supporters say now that he wasn't in full command of the facts of the case when he wrote his memo, well before he'd been nominated to return to the Justice Department. Now that he is, Barr has pledged to let Mueller complete his work, said Sen. Lindsey Graham, R-S.C., the incoming chairman of the Judiciary Committee. What's more, Graham said this week after meeting the nominee, Barr and Mueller are personal friends — Mueller attended the weddings of Barr's children. The quality of that relationship should reassure Democrats in Congress and others that Barr isn't going to go back into the Justice Department and blow up the special counsel's office in order to protect Trump, Graham suggested. Moreover, Graham told reporters, Barr does not believe the Russia investigation is a "witch hunt." That doesn't address the question of pardons, however. Trump's onetime personal lawyer Michael Cohen has been sentenced to three years in prison. His former national security adviser Michael Flynn is awaiting sentence after pleading guilty. And so is Trump's former campaign chairman, Paul Manafort. Trump has said pardons in the Russia case are not off the table, and people including former prosecutor Carrie Cordero have taken notice. "All the different statements he makes about whether somebody is a good guy, or somebody is a 'rat' — and his constant commentary on the ongoing investigation that the special counsel is conducting — indicates that he certainly is considering the use of pardons in this case." That's why Cordero, now a senior fellow at the Center for a New American Security, said pardons may be another key issue at Barr's confirmation hearing. "The fundamental issue for the next attorney general — and for Congress to explore, and for our time — is whether or not the Trump administration is using executive authorities in an appropriate way or an abusive way," she said. President Trump's nominee for attorney general, William Barr, has his confirmation hearing this week, and the issue of pardons is almost sure to come up. Barr was attorney general under President George H.W. Bush when he pardoned officials involved in the Iran-Contra scandal. Many Republicans at the time felt that investigation was a political witch hunt. NPR national justice correspondent Carrie Johnson has more. CARRIE JOHNSON, BYLINE: The investigation ran out of oxygen on December 24, 1992. That's when President Bush pardoned six people caught up in the scandal over trading arms for hostages. GEORGE H W BUSH: But the Constitution is quite clear on the powers of the president, and sometimes the president has to make a very difficult call. And that's what I've done. JOHNSON: To the man leading the Iran-Contra investigation, the pardons of former Bush associates represented a miscarriage of justice. Here's Lawrence Walsh reacting to the news. LAWRENCE WALSH: It demonstrates that powerful people with powerful allies can commit serious crimes in high office, deliberately abusing the public trust without consequences. JOHNSON: But Bush's attorney general, William Barr, went on to tell historians that he supported the idea of pardons - clemency not only for former Defense Secretary Caspar Weinberger, who was about to go on trial, but also for other former officials he thought were treated unfairly. WILLIAM BARR: The big ones - obviously, the Iran-Contra ones - I certainly did not oppose any of them. I favored the broadest pardon authority. There were some people arguing just for Weinberger. I said, no - in for a penny, in for a pound. JOHNSON: In for a penny, in for a pound, Barr told interviewers at the Miller Center at the University of Virginia. He favored the broadest possible pardon authority. Now as Barr prepares for Senate hearings to become President Trump's attorney general, that controversy from 1992 feels familiar. MICHAEL BROMWICH: His view of the pardon power and in what circumstances it ought to be exercised is an extremely relevant issue, particularly because of the widely publicized accounts suggesting that the president has considered pardoning a number of people. JOHNSON: Michael Bromwich once worked on the Iran-Contra prosecution team. He had left the office by 1992, but he remembers the reaction to the pardons at the time. BROMWICH: But the office had developed evidence over the course of many years suggesting that there had been a high-level conspiracy to obstruct the investigation that in fact had been ongoing for many years, designed to protect, first, President Reagan, and then vice president and ultimately President Bush. JOHNSON: If he's confirmed, Bill Barr would once again become the leader of the Justice Department at a time when a criminal investigation is focused on the president and his associates. Trump's onetime personal lawyer Michael Cohen has been sentenced to three years in prison. His former national security adviser, Michael Flynn, has pleaded guilty. And his former campaign chairman Paul Manafort has been convicted by a jury. The president has said pardons are not off the table. Former prosecutor Carrie Cordero has taken notice. CARRIE CORDERO: Well, all the different statements he makes about whether somebody is a good guy or somebody is a quote-unquote, "rat" and his constant commentary on the ongoing investigation that the special counsel is conducting indicates that he certainly is considering the use of pardons in this case. JOHNSON: Cordero, a senior fellow at the Center for a New American Security, says the issue will be a key part of Barr's confirmation hearing. CORDERO: The fundamental issue for the next attorney general, and for Congress to explore and for our time is whether or not the Trump administration is using executive authorities in a appropriate way or in an abusive way. JOHNSON: Barr has generally advocated for strong executive power, but he's also told senators the Russia investigation is not a witch hunt and that he'd make sure a special counsel Robert Mueller would stay on the job. Barr's hearings kick off Tuesday morning. Carrie Johnson, NPR News, Washington. Transcript provided by NPR, Copyright NPR.